Spend another £36.98 to get FREE DELIVERY! 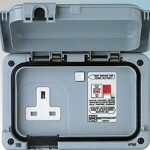 Supplied with an earth terminal in the back box. The Sentrysocket has 5 entries. Suitable for supply voltage of 240V a.c. 50Hz.